LOS ANGELES – Democratic Lt. Gov. Gavin Newsom is preparing for a move into the governor’s office following his decisive victory over Republican businessman John Cox. “This victory is really your victory, because of you, the future really belongs to California,” Newsom told supporters Tuesday night at his victory party at the Exchange LA nightclub downtown. “Now is the time for going far and going together,” he said. “Now is the time for decency, for facts, for trust, and now is the time for truth. Now it is time for leaders to lead. Cox conceded the race around 9:30 p.m., Tuesday, Nov. 6, with Newsom widening his lead as vote-counting continued. Despite the loss, the San Diego businessman said he was proud of the campaign he ran and the message he conveyed. If the votes ultimately match polling results, Newsom’s win can be attributed in part to strong support among non-partisan voters, who now outnumber Republicans statewide, as well as from Latino voters. 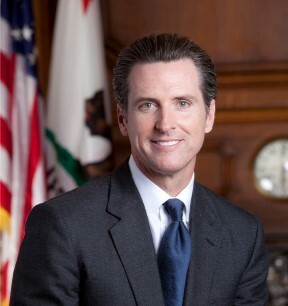 From 1996 to 2004, Newsom served on the San Francisco Board of Supervisors, where he championed a policy initiative dubbed “Care Not Cash,” slashing cash benefits for homeless individuals in favor of housing and services. Newsom has promised to oppose the Trump administration’s immigration policies and gun control — setting himself in stark opposition to Cox — and has called for universal preschool and two years of free community college as part of a push to distinguish himself as more progressive than Brown. Cox efforts to characterize the state’s high poverty rate, underperforming schools and lack of affordable housing as problems that happened “on Gavin Newsom’s watch” did not win the day. After distancing himself from Trump early on in his primary campaign, Cox picked up the president’s endorsement before the June 5th primary. Cox has since echoed some of Trump’s themes on the campaign trail, including his plan to “clean out the barn” in Sacramento as Trump promised to “drain the swamp” in Washington, D.C. Cox has taken a hard line on immigration — including supporting construction of a wall along the U.S.-Mexico border and ending “sanctuary state” policies — though he said he was against separating children from their parents at the border. In other statewide races, businesswoman and former U. S. Ambassador to Hungary Eleni Kounalakis beat Sen. Ed Hernandez, D-West Covina, in the race for lieutenant governor. Both ran on similar platforms, but Kounalakis had the endorsement of former President Barack Obama and the state’s U.S. senators, while Hernandez was backed by Secretary of State Alex Padilla and Controller Betty Yee and had more union support. Democrats won the right to keep their seats in most of the other non-judicial races statewide. Padilla beat out Republican Mark Meuser to stay on as secretary of state after running on his record in expanding access for voters. Yee, a Democrat, will remain state controller, winning handily over Republican Konstantinos Roditis. Attorney General Xavier Becerra was elected to a full term after fighting off a challenge from retired judge Steven Bailey. Becerra, a Democrat appointed in 2017 to fill the vacancy caused by Kamala Harris‘ election to the Senate, previously served 12 terms as a congressman and in his current role has pushed back hard against the Trump administration on health care, immigration and net neutrality, among other issues. Democrat Fiona Ma, a member of the state Board of Equalization, also won her race against Republican businessman Greg Conlon for state treasurer. Ma has a longer record of public service, including a term in the Assembly and a seat on the San Francisco Board of Supervisors. Sen. Ricardo Lara, D-Bell Gardens, was in a tight race with Steve Poizner, who is seeking a return to the office of state insurance commissioner after holding the job from 2007-2011. Poizner switched his registration from Republican to no party preference earlier this year. The neck-and-neck race, with Lara holding a narrow lead, likely won’t be decided for weeks until all provisional and late mail-in ballots are tallied. A tough and heavily funded non-partisan battle for superintendent of public instruction will also likely go undecided for weeks. Marshall Tuck, who led then-Mayor Antonio Villaraigosa’s Partnership for Los Angeles Schools, was running slightly ahead of Assemblyman Tony Thurmond, D-Richmond, as vote- counting continued. Tuck also led Green Dot Public Schools, a charter school chain, while Thurmond worked with at-risk youth as a social worker and spent 12 years working in public schools before being elected to the Richmond City Council and then winning two terms in the Assembly. The failures of the state’s educational system have sparked heated debate between charter school advocates and teachers unions, and the race was seen by many as a proxy war between the two. Contributions reached record proportions for the down-ballot seat, at more than $50 million, with a more than 2-1 advantage going to Tuck. The total included more than $28 million raised by independent committees and wealthy backers of the charter schools movement on Tuck’s behalf and $8 million from the California Teachers Association for Thurmond. Tuck defended the level of campaign spending to the Sacramento Bee, saying it’s required to reach the state’s more than 19 million registered voters. Both candidates said they oppose for-profit charter schools, favor more funding for schools and are advocates of reform, including new academic standards. One key point of contention is how to manage extra dollars allocated to districts with greater numbers of low-achieving students, who are often from low-income families or foster homes or learning English as a second language. Local districts have control over that money, which in some cases has been spent on teacher pay raises based on guidance from current State Superintendent Tom Torlakson. Tuck promised to end that. Thurmond was backed by Torlakson, teachers unions and the California Democratic Party. His many endorsements include Harris, House Minority Leader Nancy Pelosi, Rep. Maxine Waters, D-Los Angeles, and the Los Angeles Times. Tuck also boasted a long list of endorsements, including from Villaraigosa, former Los Angeles mayor Richard Riordan, former Obama education secretary Arne Duncan, ex-New York mayor Michael Bloomberg, the Los Angeles Daily News and Pasadena Star-News. Newsom will have the bulk of the authority to set the state’s education policy. He has called for a moratorium on charter school expansion, although he has attracted backers from both camps. 4 comments for "Newsom wins governor’s race, Cox concedes"
The only thing this clown will build on will be Browns $1.3Trillion+ debt he saddled us with. California LOVES to pay taxes. And if taxes were increased I’m sure they’d be more than offset in your wallet because employees and employers would no longer be paying insurance premiums, there’d be no more deductibles, no more co-pays and the labor market would become more fluid as people would not be tied to jobs because of their health insurance. A single-payer healthcare system in California — a galvanizing cause among the state’s progressive flank — would cost $400 billion annually, according to a legislative analysis released on Monday. 1. A total cost of $400 billion per year to cover all healthcare and administrative costs. 2. Of that, $200 billion of existing federal, state and local funds could be repurposed to go toward the single-payer system. 3. The additional $200 billion would need to be raised from new taxes.